Pompom Poppers: Cup your two hands together, palms up, with a pompom in the “bowl” you’ve made. Then gently “pop” the pompom into the air and flip your hands so the palms are down. Catch the pompom with the bowl the back of your hands have made. Then toss the pompom again and flip the hands back to the original bowl, palms up, and catch the pompom once more. Repeat and add pompoms as you become proficient. I like to use this at the beginning of pra ctice to settle everyone down. It is also a fun addition to a circus or food themed class (like popcorn popping) or a bird themed class (keep the eggs in the nest). 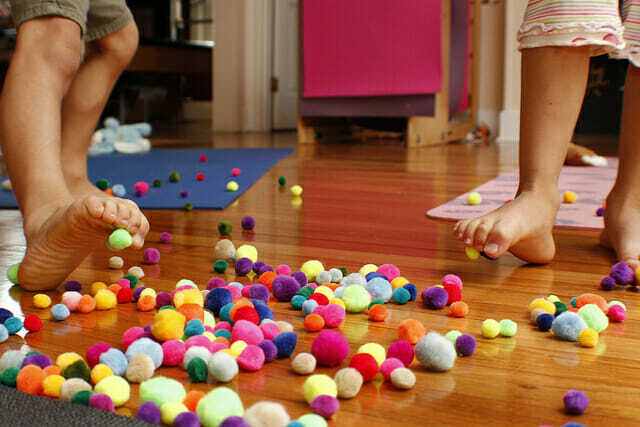 Pompom Poppers is not only fun, but a lovely meditation and mindfulness activity because it takes total concentration. Toe-ga: This activity begins by simply picking up pompoms with your toes using balance, concentration, and core strength. Once you have the hang of simple Toe-ga, make it more challenging. Maybe you sort the pompoms into color piles or into muffin tins by color (using only your toes, remember!). Place a strap (necktie or painters tape work, too) along the floor and set pompoms along it. Walk like a tightrope walker and pick up the pompoms with your toes, lifting them up to your hands. Make this extra difficult by balancing something (like a Beanie Baby) on your head. You could take the tightrope idea further for Halloween by creating a spiderweb out of the straps. The pompoms are the bugs and you are the spider picking up your meal. 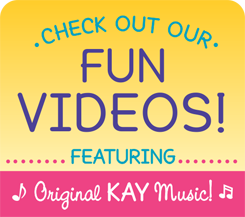 Add to the excitement by playing the Toe-ga song by Kidding Around Yoga! 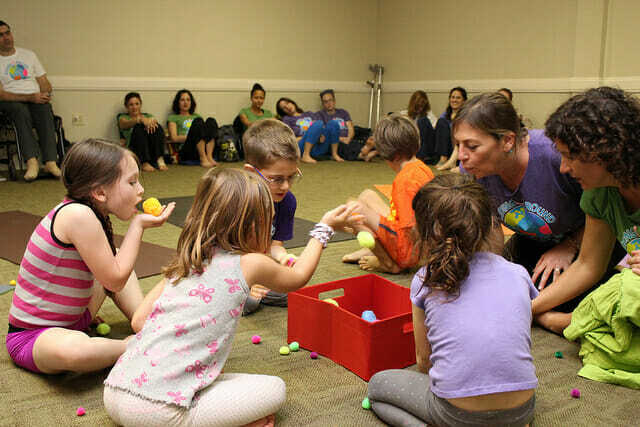 Pompom sports: These sports use your breath to move the pompom, a fun way to include pranayama into a kids’ Yoga class. Pompom basketball starts by holding a pompom in your hand and trying to blow it into a bowl or basket, using the appropriate amount of air for the exhale. Putt Putt Pranayam is miniature golf using pompoms. The mat can become the obstacles by forming bumps that you must blow the pompom over, but not too hard because you want to keep the pompom on the “green” (the mat). You could also use blocks, paper towel t ubes and other crafty things to create even more elaborate obstacles to blow the pompoms through. Ping Pong Pompom also uses a fold/bump in a mat, but this time as a net. Two players blow the pompom over the bump in the mat, back-and-forth, trying to keep the pompom in play on the court. In Pompom Darts, you create a target, either by drawing one on paper (great to use over and over again) or with painters tape on the floor. Each child has a specific colored set of pompoms (Mary has all yellow, Mike has blue, etc). Kids lie or sit evenly around the target (no moving closer) and when you say go, they blow their pompoms, one-by-one, onto the target. The one with the most points gets to assign the colors for the next round, or use Toe-ga to pick up the pompoms and put them away. Hot Potato: Just like in the classic game, as the music plays a pompom is passed around the circle of seated Yogis. When the music stops, the child holding the pompom has to do a pose of his/her choice. Then everyone tries the pose. The music then starts again. Make this more challenging by having kids pass the pompom using Pompom Popper hands.